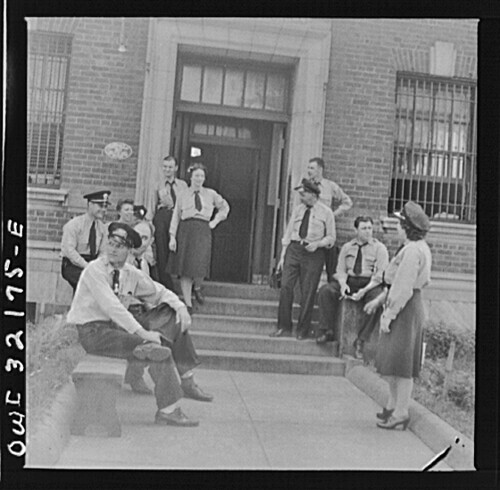 Male & Female streetcar operators relaxing on the steps of Capital Transit’s Northern Division, 4615 14th Street NW in June 1943. 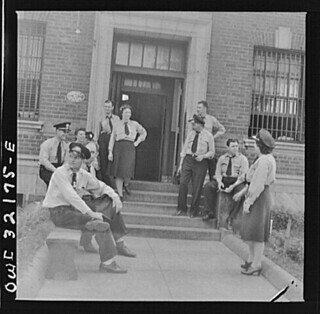 Faced with cutbacks in service due to an operator shortage during World War II, but unwilling to give into demands to hire African Americans, Capital Transit began hiring white women to operate streetcars. The company made a show of hiring one black man as a trainee in February 1943. Bernard Simmons completed his classroom training and was assigned to the Benning Road division for on the road training. However, the company reported that one white operator refused to train Simmons and others threatened to do the same. The company fired Simmons. At least one black woman “passed” and operated a streetcar for five months until a neighbor turned her in to the company and she was fired in January 1944. Sarah Grayson said, “I made no effort to conceal my racial identity. The question just never came up,” according to the Afro-American newspaper. (See offsite photo of Grayson in the Afro American newspaper www.afro.com/afroblackhistoryarchives/ Click on “World Mourns King” icon on right of the page, then click on “Browse this Newspaper,” then navigate to Feb. 5, 1944, page 11). Photo by Esther Bubley, courtesy of the Library of Congress, call number LC-USW3- 032175-E (b&w film nitrate neg).